This article will explain the steps required to utilize the Speedway Connect software by Impinj. The Speedway Connect software is a very useful tool for configuring the Speedway Revolution readers to read and report RFID tags. The Trial Version linked above only allows 500 tags to be read, but the full version can be purchased here. For steps on installing Speedway Connect, see Installing Speedway Connect for Speedway Revolution Reader. Once installed, the application will be accessible from a web browser, and logging in with Username: root and Password: impinj will show the Speedway Connect home screen below. Status - This icon will be green when the reader status is available, and red when the reader is not available. The user can toggle the Status of the reader. Save - This allows the user to download a .txt file that lists the current settings. Open - This allows the user to upload a previously saved settings configuration file to the reader. Help - Describes the actions you can take on the Web UI. Uninstall - Uninstalls Speedway Connect from the reader. Questions Marks - The question marks on the right side of each section header will show descriptions of each section and its components. These descriptions are shown for each section below. This section allows the user to select the EPC Gen2 standards to apply to the reader, such as Reader Mode, Search Mode, Session, and Population Estimate. Please see the image below for a description of all of these items. This section allows the user to select which antenna ports to use on their Speedway reader, as well as set the receive sensitivity and transmit power for each antenna. 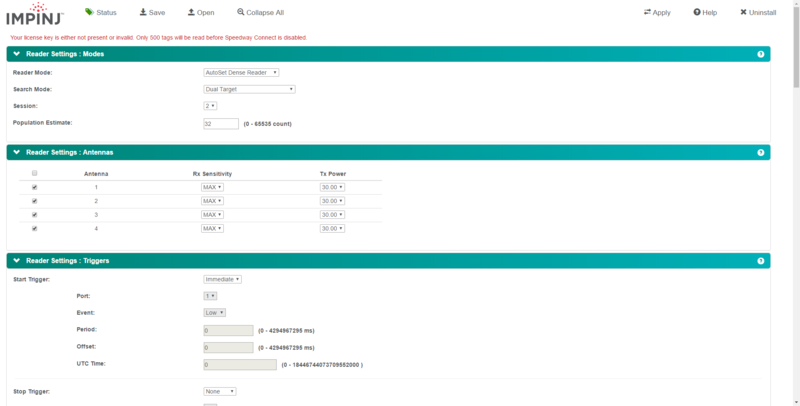 This section allows the user to configure the triggers used by Speedway Connect. A trigger will tell the reader when to initiate a read sequence, as well as when to end the sequence. Triggers can be set to be immediate, periodic, or based on an input (GPI). This section allows the user to configure the duty cycle of the reader, which is the amount of time the antennas are transmitting versus the time the antennas are not powered. In this section, the user is able to configure the data being output by Speedway Connect, as well as the data's format. This section allows the user to configure the output method for Speedway Connect. Important notes for each of these output methods can be seen in the description for each method below. This functionality allows the reader to filter out tag reports that occur within the specified Read Window. This section allows the user to set filters at the chip-level of a tag, known as standard Gen2 filters. GPO can be used to send a signal to another device once a specific condition is met. This GPO signal can be used operate devices such as light stacks and buzzers using the Impinj GPIO Box. This section allows the user to configure their specific instance of Speedway Connect, and is also where the full Speedway Connect version license key is entered to activate the license.